In recent years, the extent to which contemporary societies are secular has come under scrutiny. At the same time, many countries, especially in Europe, have increasingly large nonaffiliate, ‘subjectively secular’ populations, whilst nonreligious cultural movements like the New Atheism and the Sunday Assembly have come to prominence. Making sense of secularity, irreligion, and the relationship between them has therefore emerged as a crucial task for those seeking to understand contemporary societies and the nature of modern life. Drawing on ethnographic fieldwork in southeast England, Recognizing the Nonreligious develops a new vocabulary, theory and methodology for thinking about the secular. It distinguishes between separate and incommensurable aspects of so-called secularity as insubstantial – involving merely the absence of religion – and substantial – involving beliefs, ritual practice, and identities that are alternative to religious ones. Recognizing the cultural forms that present themselves as nonreligious therefore opens up new, more egalitarian and more theoretically coherent ways of thinking about people who are ‘not religious’. It is also argued that recognizing the nonreligious allows us to reimagine the secular itself in new and productive ways. This book is part of a fast-growing area of research that builds upon and contributes to theoretical debates concerning secularization, ‘desecularization’, religious change, postsecularity and postcolonial approaches to religion and secularism. As well as presenting new research, this book gathers insights from the wider studies of nonreligion, atheism, and secularism in order to consolidate a theoretical framework, conceptual foundation and agenda for future research. The book examines selected faith-based organisations (FBOs) and their attempts to seek to influence debate and decision-making at the United Nations (UN). Increasing attention on FBOs in this context has followed what is widely understood as a widespread, post-Cold War ‘religious resurgence’, which characterises a novel ‘postsecular’ international environment. One aspect of the new postsecular environment is increasing focus on global public policy at the UN, from FBOs from various religious traditions, especially Christianity, Islam, and Judaism. This February, Liturgical Press will publish Where Justice and Mercy Meet (2013) edited by Vicki Schieber (Catholic Mobilizing Network), Trudy D. Conway (Mount St. Mary’s University), and David Matzko McCarthy (Mount St. Mary’s University). The publisher’s description follows. 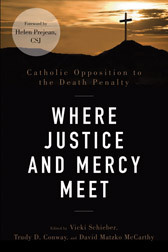 Where Justice and Mercy Meet: Catholic Opposition to the Death Penalty comprehensively explores the Catholic stance against capital punishment in new and important ways. The broad perspective of this book has been shaped in conversation with the Catholic Mobilizing Network to End the Use of the Death Penalty, as well as through the witness of family members of murder victims and the spiritual advisors of condemned inmates. The book offers the reader new insight into the debates about capital punishment; provides revealing, and sometimes surprising, information about methods of execution; and explores national and international trends and movements related to the death penalty. It also addresses how the death penalty has been intertwined with racism, the high percentage of the mentally disabled on death row, and how the death penalty disproportionately affects the poor. The foundation for the church’s position on the death penalty is illuminated by discussion of the life and death of Jesus, Scripture, the Mass, the Catechism of the Catholic Church, and the teachings of Pope John Paul II. Written for concerned Catholics and other interested readers, the book contains contemporary stories and examples, as well as discussion questions to engage groups in exploring complex issues. This November, Oxford University Press will publish Articles of Faith: Religion, Secularism, and the Indian Supreme Court by Ronojoy Sen (National University of Singapore). The publisher’s description follows. This book examines the relationship of religion and the Indian state and seeks to answer the question: ‘How has the higher judiciary in Independent India interpreted the right to freedom of religion and in turn influenced the discourse on secularism and nationhood?’ The author examines the tension between judgments that attempt to define the essence of religion and in many ways to ‘rationalize’ it, and a society where religion occupies a prominent space. He places the judicial discourse within the wider political and philosophical context of Indian secularism. The author also focuses on judgments related to Article 44, under the Directive Principles of State Policy, which places a duty on the state to ‘secure’ a uniform civil code for the nation. His contention is that the Indian Supreme Court has actively aimed at reform and rationalization of obscurantist religious views and institutions and has, as a result, contributed to a ‘homogenization of religion’ and also the nation, that it has not shown adequate sensitivity to the pluralism of Indian polity and the rights of minorities. Sasha Volokh has been writing a series of deeply interesting and thoughtful articles on the phenomenon of the faith-based prison, focusing especially on the effectiveness of faith-based prisons in reducing recidivism and in other ways. Readers interested in the subject will find much to admire in Sasha’s careful and provocative work: see here and here. For criticism of Sasha’s views, see this short reply by Giovanna Shay. For my own take on faith-based prisons — which focuses neither on empirical nor constitutional questions, but instead on the conceptual position, historical and contemporary, of (religious) penance in punishment theory — see this piece. During the month of December, I participated in a debate about the death penalty with Dr. Ernest van den Haag. The debate was sponsored by the newly-formed Duquesne Law School chapter of the Federalist Society. During this debate, I expressed the view that secular society lacks “permission” to impose the death penalty. Dr. van den Haag responded at the time that “we give ourselves permission.” Later, Dr. van den Haag agreed to a brief, further exploration of this theme in the pages of the Duquesne Law Review. What began for me as an exploration of God’s permission for the death penalty in a secular state, has evolved into a consideration of the religious assumptions underlying the death penalty in a secular state. In order to identify these assumptions, it is first necessary to examine the secular justifications for the death penalty given by Dr. van den Haag.